2014 has been a tumultuous year in international affairs. From the conflict in Ukraine, to horrific bloodshed in Syria and Iraq, the spreading Ebola epidemic in West Africa and continued weakness in the European economy, numerous world crises have given people plenty to be worried about. Prior to the Ebola outbreak in West Africa becoming a high-profile international story, a median of 29% across the seven African nations polled feared infectious disease as the top danger. Many of these countries have high prevalence rates of HIV/AIDS and have suffered through multiple disease epidemics in the last decade. However, other problems also worry Africans. In Nigeria, where religious strife is exacerbated by the Boko Haram terrorist group, more say religious and ethnic hatred is the world’s greatest threat (38%). Across the seven Middle Eastern countries surveyed, a median of 34% see religious and ethnic hatred as the world’s top threat. This includes 58% of Lebanese, a country divided by religion and bordering both Syria and Israel. Given the history of religious violence in the region, the result might not be surprising. Yet, since the question was last asked in 2007, and religious and ethnic conflicts have played out in Syria, Iraq and beyond, fears have increased significantly in the region, including Lebanon (+19 percentage points), Egypt (+18), Turkey (+9) and Jordan (+6). Before talk about a “triple dip recession” made headlines, Europeans have been overwhelmed with economic concerns and the growing gap between the rich and the poor is high on that list. Overall, a median of 32% across the seven EU nations surveyed name inequality as the top threat to the world. People in Spain and Greece, among the hardest hit by the Eurocrisis, are especially worried. In fact, worries about inequality have doubled in Spain since 2007, as well as in Italy, another economically damaged southern European country. While the British are also concerned about inequality, fears about religious and ethnic hatred are even more common in the United Kingdom (39% name it top threat). Americans are somewhat divided on their biggest fear. 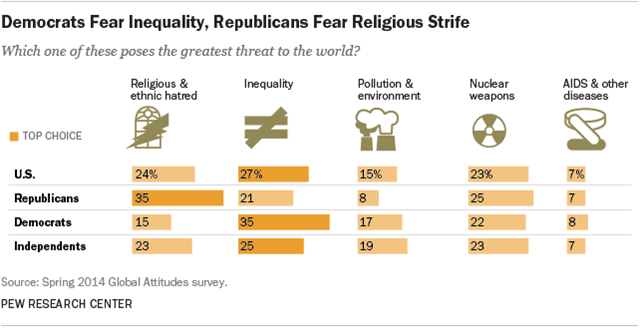 While many name inequality (27%), around a quarter also see religious and ethnic hatred (24%) and the spread of nuclear weapons (23%) as top threats. But as with many issues in the U.S., there is a party divide. Republicans are more likely than Democrats to name ethnic hatred as a top concern. And Democrats are more apt to name the gap between the rich and the poor as the greatest danger. Independents are more divided. In Japan, the only country in which nuclear weapons have been used in open warfare, nearly half of the public say the spread of such weapons is the greatest threat. Fading memories of the 1945 bombings of Hiroshima and Nagasaki may also explain why 18-29 year olds are less concerned about the spread of nuclear weapons than those 50 and older.